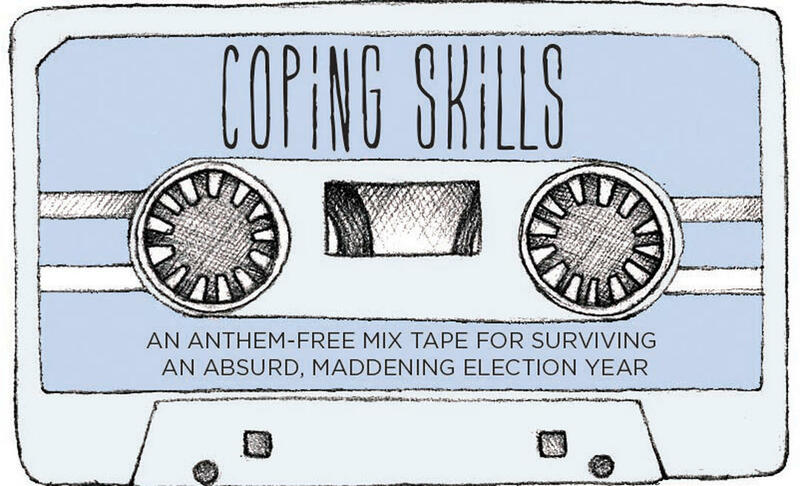 Live In-Studio: Jonathan Bower "Coping Skills Mix Tape"
Friday October 28, 2016 on the Alaska Music Spotlight we were joined by Alaskan writer and musician Jonathan Bower. He's been writing a series of articles in the Anchorage Press describing a mix-tape aimed at getting us through this absurd political season. Since you can't hear songs in the Newspaper, we brought Jonathan in to spin the music he's selected! Connect to the series in the Anchorage Press; and connect to the author Jonathan Bower. I’ve listened to one man more than any other this election season. And it’s not Donald Trump. Shortly after graduating college in the mid-1990s, I left Philadelphia and moved to southern New Hampshire to live with 20 other recent college graduates five miles deep in the woods of a state park. We were hired to help launch and establish an Americorps program sponsored by the Student Conservation Association (SCA). That year, our group dwelled in a series of dilapidated, retired 4-H lodge buildings and shack cabins without running water, and we heated all our buildings with wood stoves. Following my time in the NH forest, I accepted a fall semester teaching assistant job for a college program 20 miles up a mountain in southern Oregon. Similarly, that term I lived a lengthy drive from the closest town and in a wood-heated cabin among a group of young, hungry, earnest twenty-somethings from around the United States. So naturally, over the course of this “unplugged,” rugged living, I also stopped shaving and cutting my hair. With my afro and shock of strawberry-blonde fuzz exploding around my face, my family in PA began referring to me as the Unabomber. On a visit back east following my TA stint on the Oregon mountain, I returned to my alma mater—a small college a short drive from Philadelphia—to visit and catch up with a friend, Shawn, who was beginning his final semester there. Shortly after I arrived, we crossed paths with one of Shawn’s classmates, who I soon learned identified as a Luddite. Stunned, and right then fairly obsessed with Cohen’s work, I stopped walking and turned to steal another glimpse of the Luddite disappearing down a tree-lined path in the direction of the classroom buildings. A thought struck me then and I turned back to Shawn. That Best Of album the Luddite afforded himself served as my own introduction to Cohen’s work years earlier. There’s still a dear and timeless spirit wending through those classic songs that made Cohen famous; “Suzanne,” “So Long Marianne,” “Take This Longing,” “Famous Blue Raincoat,” and many others. However, in the mid-1980s, Cohen abandoned the romantic poet’s instrument of choice—his acoustic, nylon-stringed guitar—and swapped it out for a Casio keyboard that made his labored-over compositions sound better suited for a hazy Holiday Inn cocktail lounge than a Greenwich Village or Montreal coffee house. For as laughably corny as I initially found this sound in the 1990s, it today sounds eerily prescient, a preview of trends currently thriving throughout the pop music production landscape. His voice, meanwhile, had plunged vast registers lower than the more nasally, high-pitched troubadour’s work of “Bird On a Wire” et al. In an interview with Paul Zollo in 1992, he shared that after “50,000 cigarettes and several swimming pools of whiskey,” he noticed his voice deepening. And it continued doing so with no signs of stopping, even after he quit smoking for a time. He “copped to the fact” of his new vocal delivery and, with the lounge-worthy synthesizer, embraced a new era of his career. Note that there wasn’t an Internet to log onto in 1992. No online accounts to hack into, thieve or protect with a laundry list of passwords. No Google search; no Amazon shopping. No Facebook or social media sites on which to advertise my life or hawk my wares or to feature my preferences and curate my self-important experiences. No smart phones. However, as I watched the news channels’ mad dash with Trump’s latest blather, I don’t know what surprised me more—that Trump decided to “go there,” or that all the talking heads across the blinking row of televisions appeared astonished and anxious as they ceaselessly buzzed about Trump’s assertion. That this was was news to them—and so, by association, to us—wildly frustrated me. The news media, Donald Trump, and least of all, it seems, his supporters, have clearly not been listening to or heeding Leonard Cohen. But that makes sense. In literature and religious myths, no one seems overly inclined to heed the words of the prophet, the seer, the oracle. Humanity, without fail, prefers to learn its lessons the hard way. Shortly after concluding a world tour in support of his 1992 album, The Future, Cohen—a longtime student of Zen Buddhism—stepped out of the limelight, hung up his suit and donned a monk’s robes. He retreated to Mt. Baldy, a Buddhist retreat center east of Los Angeles, where his longtime teacher lived and served. He would remain there until 1999. The essayist and author, Pico Iyer, visited with Cohen near the end of his residency at Mt. Baldy in the late 1990’s. And then, in October 2001, Cohen surprised his audience with his first album of new material in almost ten years. On one hand, the timing for Ten New Songs could not have been more perfect. The country, still upended and reeling from the tragedies of September 11, had just lived through the defining crisis of my generation. In my own, singular anxiety and distress of that period—those days and weeks following 9/11—and on learning Cohen would break nearly a decade of silence with new songs only weeks into our shock and our grief, I couldn’t help wondering what the prophet who had last darkly hearkened about The Future might say or predict or offer in the wounded, terrifying moment that we then collectively found ourselves. And yet, the Cohen who came off the mountain didn’t snarl and growl shadowy, nicotine-fueled prophecies at listeners any longer, as much as croon and nearly whisper a running series of heartfelt considerations and contemplations. The Leonard Cohen of Ten New Songs, and every album since 2001, speaks from a specific, considerable affording of wide open space—an immeasurable, interior no-man’s land situated between peace and agony, fury and calm—the likes of which I’ve never witnessed or encountered in the work of any other living songwriter. But until news of his death reaches me—and then for many years afterwards, I’m sure —I’ll continue dialing into that low, whiskey-soaked baritone, seeking the true north of the times in which we find ourselves. Because, as I soon enough learned during the years spent going into the woods and then to the mountain tops, living deliberately and deeply—fronting only the essential facts and shaving close —is not a singular experience, but a lifelong task. One that demands as much of our unmediated and clear-eyed attention to the interior landscape as we may prove inclined or prefer to pay the outer one. This disturbing and unimaginably awful election season is, one must hope, nearly behind us. The prophet’s words, meanwhile, are never behind us, but always a few hazy feet ahead of the direction we’re going, always a preview of what we might expect along our uncharted course. Found what they will always want again.